From Robin: "Growing up in the foothills of North Carolina and enjoying Eastern North Carolina BBQ, we always had barbecue slaw or red slaw served with our pulled pork. The spicy, crunchy texture of the marinated cabbage takes BBQ to the next level. Serve with pork or chicken." Place the cabbage into a salad bowl. In a small bowl, whisk together apple cider vinegar, ketchup, sugar, red pepper flakes, and hot sauce until the sugar has dissolved. 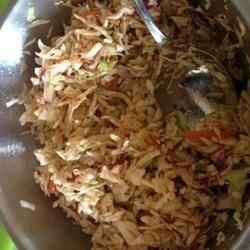 Pour the dressing over the cabbage, toss thoroughly, and refrigerate at least 1 hour before serving.